Due to the Independence Day holiday, there’ll be no Board meeting this month. Our chapter’s next Young Eagles Rally will be held on Saturday, October 6. We are setting up a Young Eagles registration online process using EAA endorsed software named Flight Squid. This allows both pilots and Young Eagles to sign up online and completes much of the required Young Eagle paperwork in a seamless process. This process is identical to the one we used for our May 12 Rally. Please provide us with feedback – we’re curious as to what your experiences are with the process. Young Eagles can register too. We are happy to announce that Chapter 1541 has scheduled another Young Eagle Rally on Saturday, October 6. For those few who may not be familiar, Young Eagles is an EAA program designed to introduce young people to aviation by offering a short, free airplane ride. The program was launched in 1992 and, nationwide, has provided well over 2 million rides. Our chapter last flew Young Eagles in May. The October 6th Rally will be conducted between 09:00 and 13:00. Please respond to this if you want to get involved early. We’re having a hangar work party to clean and paint a 2nd coat of sealer on the floor. We also want to work on the south wall insulation. For those who were unable to attend the memorial service, or for those who would like another look at the video presentation of Richard and Sue’s photos and memories, the family has provided a link to the presentation. Want to go fly somewhere? 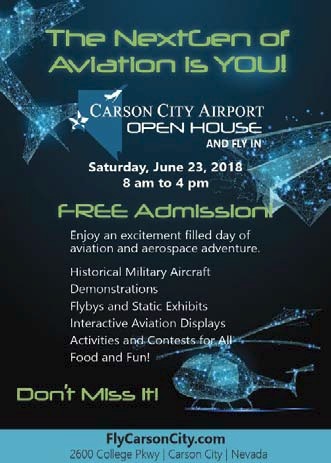 Join our chapter on Saturday, June 23, for a flight over those eastern mountains to Carson City Airport to attend an airport open house. It is 78 nm as the Cessna flies, right up over Lake Tahoe and then a quick descent into Carson City. A bit tentative about flying over that way? Bruce Estes will conduct a short briefing at the EAA Hangar at 09:00 that morning to allay your concerns. Come out for our chapter’s regular monthly member meeting at the EAA hangar on Wednesday night, June 20. We will offer a BBQ dinner beginning at 18:00 so you don’t have to cook that night. Meeting will start at about 18:45 or so with some short business items to cover. At about 19:00, we will have a presentation by Thomas Camilli of Auburn Chapter 526 on his cross-country round trip trek from Auburn to Sun ‘n Fun at Lakeland, Florida, this past spring. He made the trip in his SunDancer motorglider. His presentation includes an EAA video that shows the highlights of the event. Some major changes are coming to the Class Bravo airspace in the Bay Area. 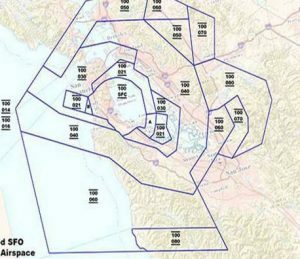 Most of the changes are being made to ensure air carrier traffic arriving and departing from KSFO remain within the Class Bravo airspace on their arrival and departure routing. Anyone used to “the old way” needs to take a close look at “the new way” after August 16. The June Board of Directors meeting takes place on Wednesday 13th. It will be at the House of Pizza, 2270 Nicolaus Rd., Lincoln… dinner at 18:00, meeting at 18:30. All members are invited. LRAA Display Day on Saturday, June 16. Holiday Party: dates and location and chairperson? We’re going to be cooking breakfast at the LRAA display day again, on Saturday, June 16th. We’re hoping to get people to come out to the airport to see the displayed aircraft, so bring your friends, bring your neighbours, bring your family!